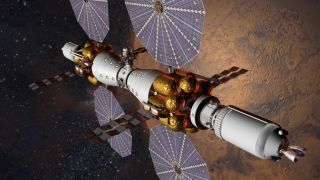 An artist’s concept for Mars Base Camp space station proposed by Lockheed Martin. Representatives from several space companies say private partnerships could accelerate NASA’s push to Mars. Commercial space companies today (July 13) urged legislators to extend NASA's successful public-private partnerships for International Space Station transportation to future programs, including human missions to Mars. NASA already is working with six firms to develop prototype habitats that would augment the agency's multibillion-dollar Orion capsule and Space Launch System heavy-lift rocket. NASA has said it intends to use the system to send astronauts to Mars in the 2030s. Technologies that SpaceX would be interested in developing in partnership with NASA include heavy-cargo missions to Mars, deep-space communications systems, and demonstrations of vertical takeoff and landing on the moon, Hughes said. He pointed to the results from NASA’s Commercial Orbital Transportation Services, or COTS, program, which leveraged $800 million of taypayer dollars with millions commercial investment to develop two medium-class launch vehicles and two cargo capsules at a far lower cost and much faster than any previous space vehicle development effort. The key beneficiaries of COTS — SpaceX and Orbital ATK — now regularly fly cargo to the International Space Station for NASA under separate launch service contracts. A third company, Sierra Nevada Corp., is expected to add its winged Dream Chaser space plane to the fleet in late 2019. NASA also is funding COTS-like partnerships with SpaceX and Boeing to develop two transportation systems for astronauts. "The features associated with the COTS program can be more broadly applied now to the development of deep-space exploration systems for transportation, habitats, communications, reconnaissance and resource utilization," Hughes said. SpaceX is planning its own private mission to Mars using its Dragon spacecraft. "This encourages fresh thinking and creative problem-solving," Hughes said, adding that competition is critical to the success of COTs-like programs. Jeff Manber, founder and chief executive of Houston-based NanoRacks, told the Senate subcommittee that public-private partnerships could also help the country transition to an Earth-orbiting research base after the International Space Station is deorbited. Whether the station's mission ends in 2024 or beyond, the United States should avoid a gap in low-Earth orbit human spaceflight, Manber said. "It's critical that we don't end the International Space Station until we have established commercial operations in low-Earth orbit," said Kennedy Space Center director Robert Cabana. "Right now, the space station serves as a critical destination for our commercial partners."